Initially it sounded bright, then warm and boomy, so it clearly needs time to burn in (especially those old Sprague caps), so I'm going to need to get some hours on it before I can really compare it to anything else. The sound will change quite a bit with an op-amp swap. Right now I have the $1.10 Texas Instruments RC4580IP in there, but I'm sure I'll settle on something else later on. The resistors are Koa Speers 2W flameproof carbon films, also sold under the brand Kiwame. You can get them from Mouser by typing SPR2 and the value you need for about 40-50 cents a pop. They have limited values, so just use vishays for whatever they don't have or you could order the Kiwames from PCX for $1.10 or so each. rtaylor76, FlySweep, pedalhead and 1 other person like this. ...I've been using his chassis for many years. Great product, hand-made in the USA. The front panel has a four pin as most of my headphones are wired that way, so it saves me from using an adapter. Wiring is scraps of Cardas I had in my wire bin, 4x24, 2x24 and 2x21 and some 24AWG. Pot is Audionote. IEC filter is Furutech, picked a few up when they were discontinued for a nice price. RCAs are Cardas. Most of the caps in the audio section are SILMIC II. I know Wayne mentioned in the video they aren't as reliable lately, but they sound good... so hopefully they'll be okay for a while. Resistors are mostly Koa Speers 2W with some Vishays here and there. 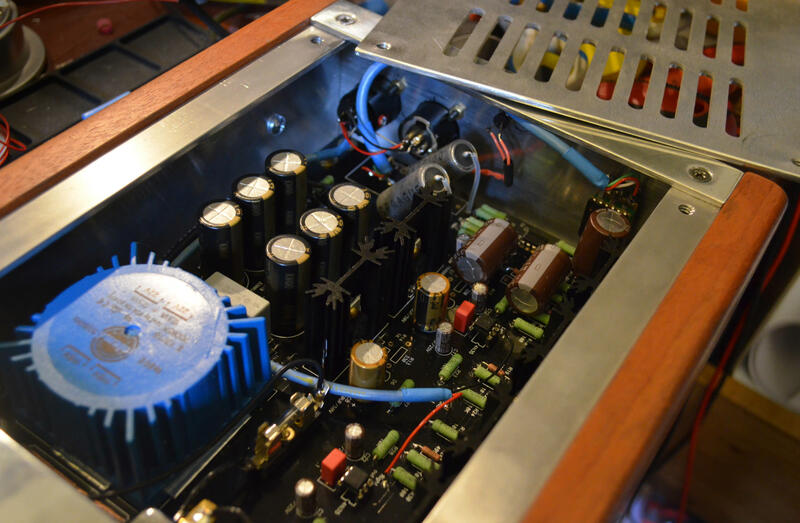 Input coupling are vintage 100V Sprague PIOs. PSU caps are Nichicon "For Audio"... for whatever that's good for Everything else is from the BOM. 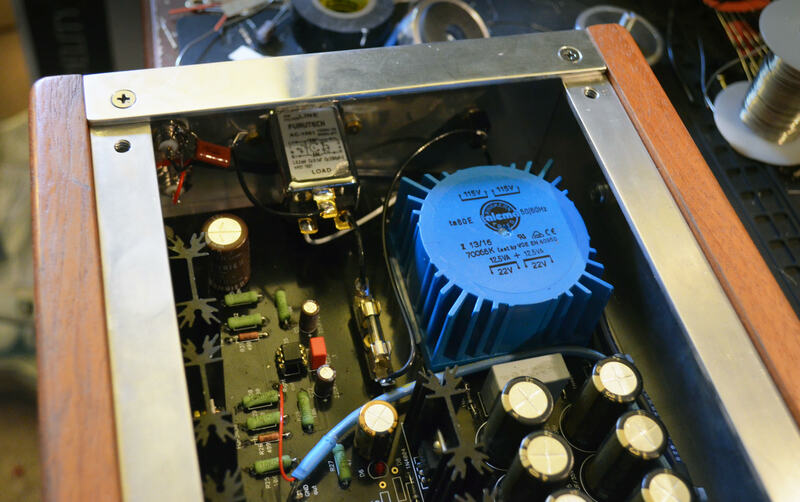 If you use the same parts you should end up with a warmer sounding amp... although the op-amp will probably make more difference than all those other items. batriq, FlySweep, JK47 and 2 others like this. Try the URL (or this page) is an incognito/private window and see if it works for you. 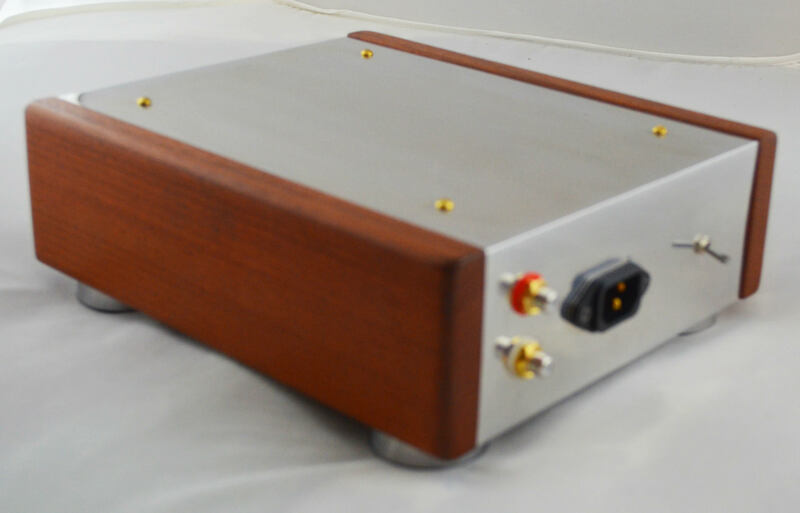 update: I just registered for DIYAudio, and now I can see the pics. Sort of not a great way to post them. Yeah they are hosted over there... didn't know they were on lock-down. I'll put em on Imgur and hope they don't go the way of Photobucket any time soon. Sorry for the mix-up ... still new to this forum. If anyone wants to add an LED to the front like I did, you can use the circuit below and run it off the 22V secondary. daniellistens, Grattle, Kattefjaes and 10 others like this. Keep up the good work and the updates coming. I did the best I could to clean things up here. You should be able to keep hosting from DIY Audio if you like. ALL: Some of the pictures are hosted @ DIY Audio, you will need to register and login @ DIY Audio to view them. Thanks Ultrabike! I think most are moved over. I discovered I have Burson singles so there are some duals on the way - V5 and V5i that I will be trying in the unit once it's burnt in. I've done some opamp rolling in a Nuforce HA-200 and I found that I liked the Sonic Imagery 994 over the Bursons if you've not heard of them before. I felt like the 994s were less harsh and had better layering and microdynamics. Thanks for the heads up Famish. Because of the layout of this particular amp and the caps immediately to the left and right of the socket, that might be a tough fit. 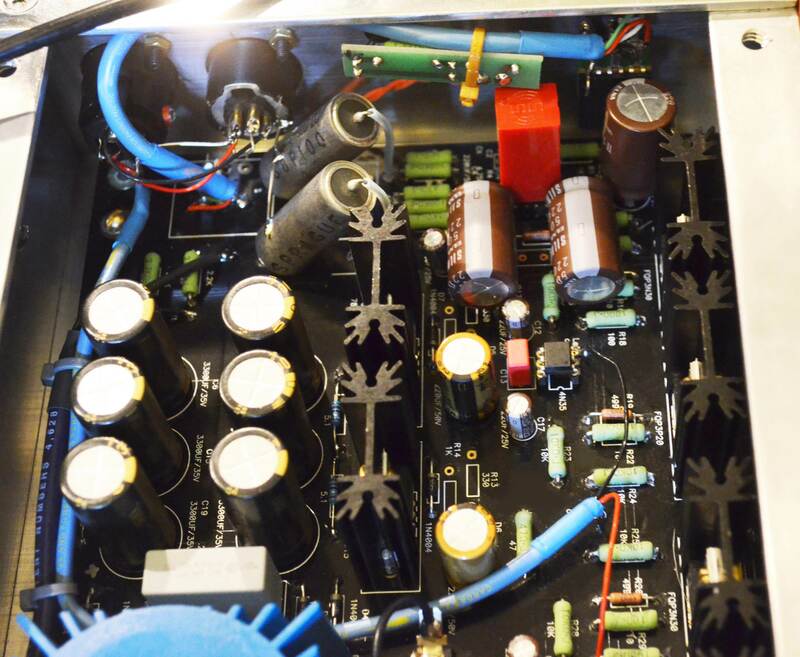 If you look at that image where the two brown caps (Silmic IIs) are sitting sideways, right between the two of them is the op-amp socket. I had to keep the front panel clear in that area anticipating the Burson, so yes, things are pretty tight! Which Bursons did you compare to the 994? Did you use the LV or standard model? Yeah I'm thinking you'll have to run a stacked socket, and I've been interested in building this amp as well so I'm wondering how to shoe it in. The other opamp I tried was the Sparkos Labs SS3602: http://sparkoslabs.com/discrete-op-amps/ which would be a much easier fit, but I felt it rolled off the treble and has a touch too much bass and warmth for my liking, but was still preferable over the Burson. I tried the standard model since my amp has +/-15V rails. I would try an OPA2134 or OPA2228. The 2134 will be similar to the 2604, maybe just not as dark. It has a tad more mA of driving current (35 vs 40mA). The 2228 will be much clearer, but is unstable at unity. So as long as R12 is not 10K. Finished my WHAMMY build a few minutes ago. In honor of our good friend Cizx.∞ I started out with his companies Analog Devices 823 opamp and will continue to warm this sucka up before I try a few other opamps I have kicking around. Luckbad, Griffon, rtaylor76 and 15 others like this. Just got the Burson's today so will be testing soon! 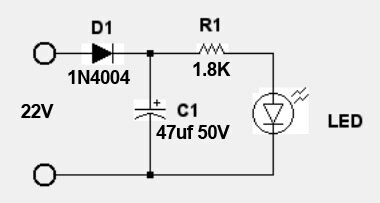 What's the power output of the amp? Bounced around DIY Audio and couldn't find it clearly stated. Another member PM'ed me about what is not included in the posted BOM. I figured I'd post that here as it may be useful for others. IEC inlet with fuse drawer - I usually get Schurter brand but there are plenty of others, you can also get a filtered one if desired. Thermal paste/thermal grease. - If you have some from a computer processor it would likely be okay, I ordered 567-120-SA from Mouser for ~$4. If you need further info on any of these just ask. I just noticed from the pictures that you mounted the board upside down in the case. Neat. Ah, yeah, tube amp chassis so they are normally mounted with the PCB upside-down and the tubes mounted on the reverse of the PCB. Might that cause heat build-up under the board? Nah it'll be fine. Aluminum shell with vents on the bottom. This unit doesn't generate much heat either, just a little bit comes off the heatsinks. 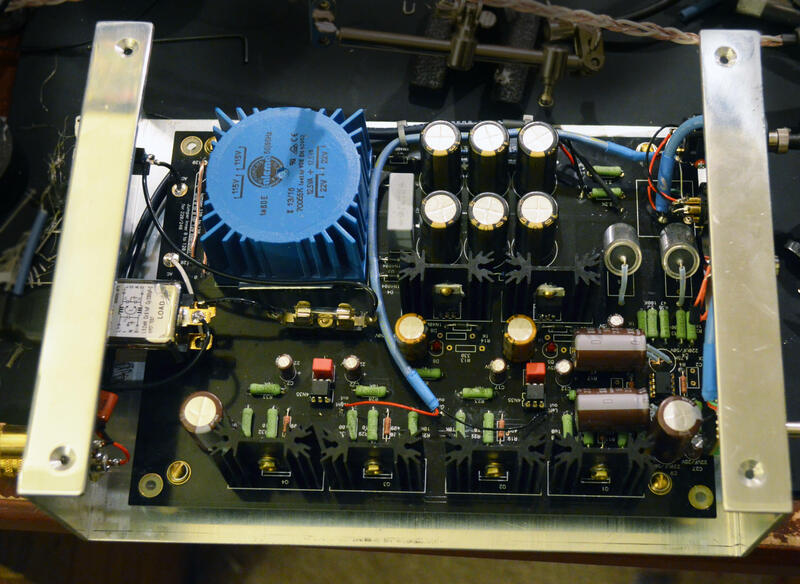 No big power supply resistors dropping voltage or anything here If you had a typical Pass Labs amp though and the heatsinks were mounted inside a solid chassis you might be in for a problem. Mucho wattage at class A can create quite a space heater. Got the dual Burson in the mail and dropped it in. I had a single version before hence it wasn't working. The dual works perfectly well and sounds a little less constricted than the Texas Instruments op-amp that's in the BOM. 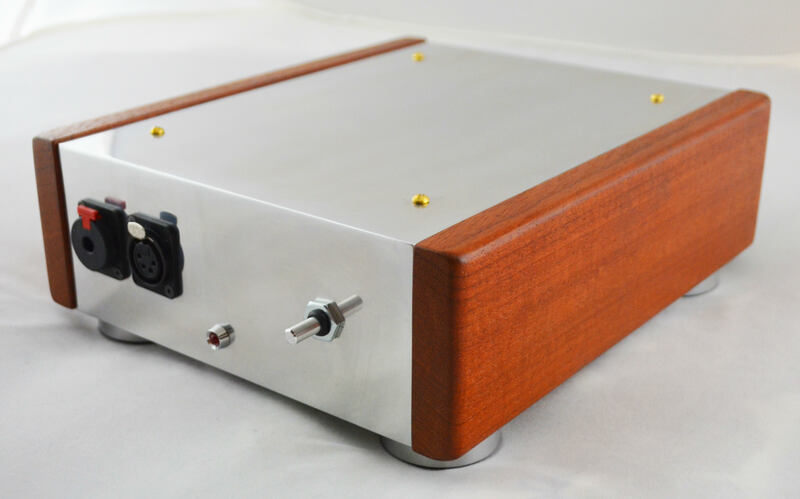 The difference was much less pronounced than if you use a Burson in a DAC, but still an improvement and worth the price of admission (you only need one). I found the V5i picked up a little more noise in this amp, so stick with the V5 if you get one. I also swapped in and out the optional capacitors but wasn't able to hear any difference.